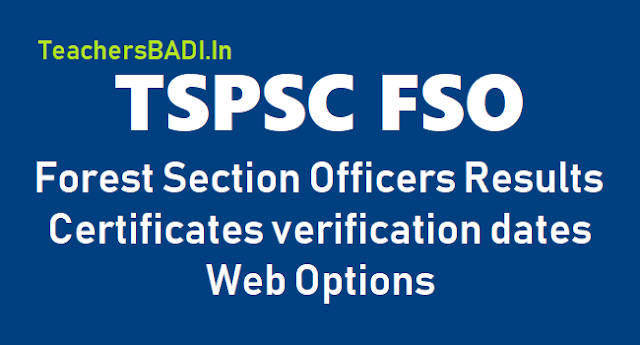 TSPSC FSO Forest Section Officers Results, Certificates verification dates, Web Options 2018 and List of documents for certificates verifications: On the basis of written examination held on 22/10/2017 FN & AN for the post of Forest Section Officer in Forest Department vide Notification No.47/2017, The provisionally admitted candidates who are qualified in Physical test and events are called for certificate verification with required certificates/documents which is to be held on 26-06-2018 & 27-06-2018 at Poti Sree Ramulu Telugu University, Near Public Gardens, Nampally, Hyderabad by 10:00 A.M. onwards. The candidates who are selected in 2nd spell provisionally qualified in physical and walking test are called for the verification of Certificates for the post of Forest Section Officer in Forest Department Notification No.47/2017 Examination held on 22/10/2017 FN & AN and Physical Test events held from 05/11/2018 & 06/11/2018 to the Post of Forest Section Officer in Forest Department, the candidates with the following Hall Ticket Numbers are provisionally picked up for Certificate Verification. The Certificate Verification is scheduled to be held on 29/11/2018 at TSPSC, Prathibha Bhavan, Nampally, Hyderabad from 10:00 AM onwards. The candidates have to compulsory exercise Web Options preferences for District / Unit / Agency Area wise from 25-11-2018 to 28-11-2018 through the link provided on the Commission’s Website. The candidates who are called for Verification of Certificates have to produce the following certificates in original along with a set of Photo - set copies duly attested by Gazetted Officer at the time of Verification of Certificates, failing which, they will not be admitted in subsequent process of selection. No request will be entertained for subsequent submission of any of the required certificates. In terms of the Notification, the candidate should possess the requisite qualifications as on the date of the Notification. The Commission reserves the right to disqualify any candidate, if qualification is not equivalent to the prescribed subjects as per Notification and if he / she is not found eligible for any reason at any stage. Admission to Certificates Verification does not conferipso facto right for Final Selection. 1. Checklist (Basic information data to be filled by the candidate & download from the Commission’s website, 1 Set). 2. Hall Ticket of the examination held on 22-10-2017 FN & AN. 4. Un-Employee declaration for claiming fee exemption for the applicants who are in the age group of 18 - 44years (OC Un-Employees). 5. School Study Certificate from 4th to 10th class or Certificate of Residence/Nativity (When the candidates have not studied in School but studied privately or in open school). 6. Provisional or Convocation Certificate and Marks Memo (Graduation). 7. Integrated Community certificate (Caste Certificate) issued by T.S. Government with Father/Mother Name as per Memo No.3009/BCW/OP/2011, BC Welfare (OP) Dept,Dt: 18-12-2015 (Prescribed format hosted on website) form VII B. 8. Non - Creamy Layer certificate (Caste Certificate) issued by T.S. Government with Father / Mother Name. 9. Certificate of EYE VISION proforma (to be certified by an ophthalmologist not below the rank of Civil Asst. Surgeon). Profoma may be downloaded from the Commission’s website. 10. Proof of age relaxation in case of Telangana State Government Servant, Regular Service certificates from the concerned department, Government of Telangana State / NCC Instructor certificate/ Retrenched Census service certificate, if any. 11. ST Candidates in Agency areas should produce local area certificate issued by the concerned Tahsildar / Mandal Revenue Officer which is the criteria for admission of local candidature. 12. NOC from employer for In- service candidates. 13. 2 sets of Attestation forms duly signed by Gazette Officer. 14. Any other relevant document in pursuance of Notification. TSPSC FSO Forest Section Officers Results, Certificates verification dates, Web Options 2018: అటవీ సెక్షన్‌ అధికారుల పోస్టుల భర్తీకి రెండో విడత ధ్రువీకరణ పత్రాల పరిశీలన న‌వంబ‌రు 29న ఉంటుందని టీఎస్‌పీఎస్సీ కార్యదర్శి వాణిప్రసాద్‌ తెలిపారు. అభ్యర్థులు జిల్లా, యూనిట్, ఏజెన్సీ వారీగా వెబ్‌ఆప్షన్లు 28లోగా ఇవ్వాలని పేర్కొన్నారు. The candidates are hereby directed to exercise post preference/Web Options for post in Un-reserved, Local and Agency area (for Schedule Tribe candidates). The facility will be available from 22-06-2018 to 25-06- 2018. The candidates should avail this facility from 22-06-2018 onwards. Please visit the Commission’s website (www.tspsc.gov.in) for further details. It is hereby notified that on the basis of the written examination held on 22/10/2017 FN & AN and Physical Test events held from 05/05/2018 to 11/05/2018 to the Post of Forest Section Officer in Forest Department, the candidates with the following Hall Ticket Numbers are provisionally picked up for Certificate Verification. The Certificate Verification is scheduled to be held on 26/06/2018 & 27/06/2018 at Potti Sree Ramulu Telugu University, Near Public Gardens, Nampally, Hyderabad from 10:00 AM, onwards. The candidates have to compulsory exercise Web Options / Post Preferences / District / Unit / Agency Area wise from 22/06/2018 to 25/06/2018 through the link provided on the Commission’s Website. The candidates who are called for Verification of Certificates have to produce the following certificate in original along with a set of Photostat copies duly attested by Gazetted Officer at the time of Verification of Certificates, failing which, they will not be admitted in subsequent process of selection. No request will be entertained for subsequent submission of any of the required certificates. In terms of the Notification, the candidate should possess the requisite qualifications as on the date of the Notification. The Commission reserves right to disqualify any candidate, if qualification is not equivalent to the prescribed subjects as per Notification and if she is not found eligible for any reason at any stage. Admission to Certificates Verification does not confer ipso facto right for Final Selection.